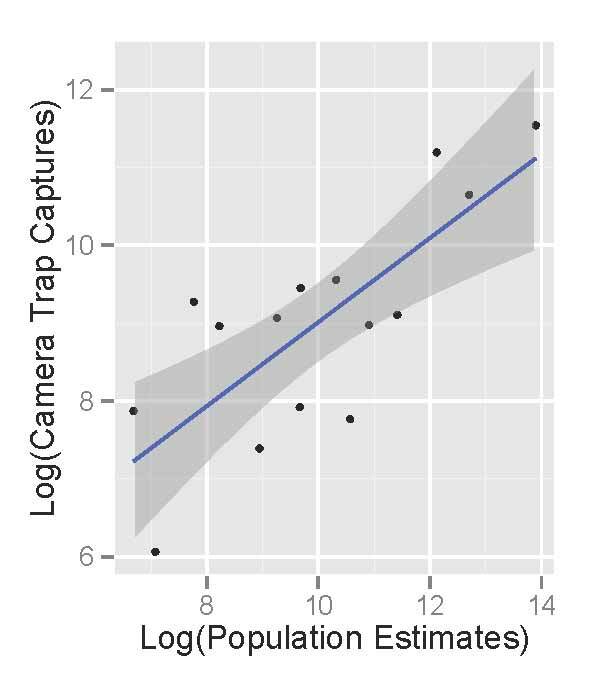 Last week I wrote about using really simple approaches to interpret camera trap data. Doing so makes the cameras a really powerful tool that virtually any research team around the world can use to quickly survey an ecosystem. Existing monitoring projects in Serengeti give us a really rare opportunity to actually validate our results from Snapshot Serengeti: we can compare what we’re seeing in the cameras to what we see, say, from radio-tracking collared lions, or to the number of buffalo and elephants counted during routine flight surveys. Ingela scanning for lions from the roof of the car. One of the things we’ve been hoping to do with the cameras is to use them to understand where species are, and how those distributions change. As you know, I’ve struggled a bit with matching lion photographs to known lion ranging patterns. Lions like shade, and because of that, they are drawn to camera traps on lone, shady trees on the plains from miles and miles away. 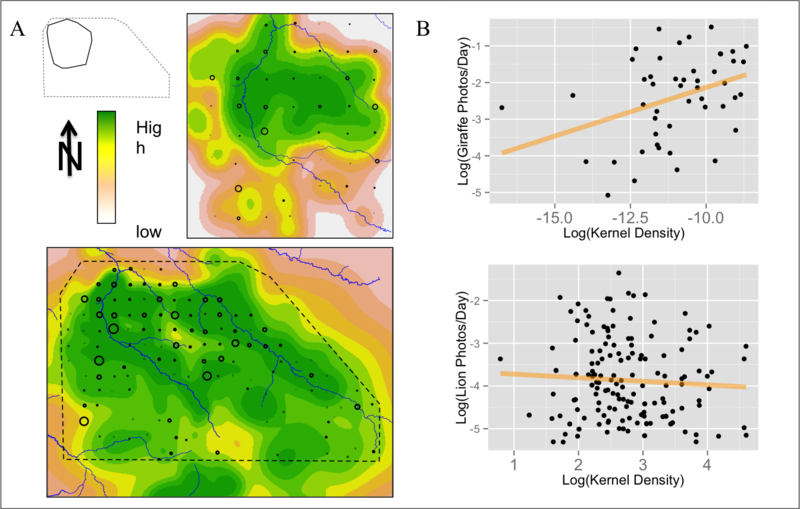 But I’ve finally been able to compare camera trap captures to know distributions for other animals. Well, one other animal: giraffes. 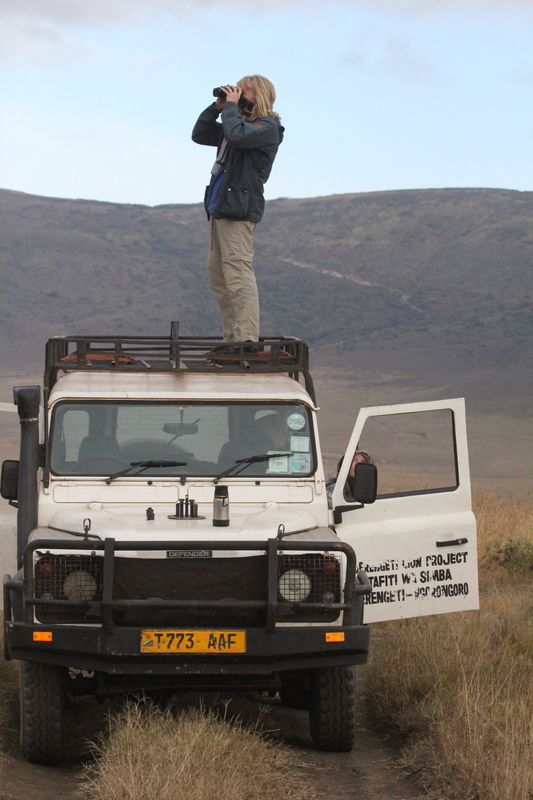 From 2008-2010, another UMN graduate student, Megan Strauss, studied Serengeti giraffes and recorded where they were. By comparing her data with camera trap data, we can see that the cameras do okay. The graph below compares camera trap captures to known densities of giraffes and lions. Each circle represents a camera trap; the bigger the circle, the more photos of giraffes (top row) or lions (bottom row). The background colors reflect known relative densities measured from long-term monitoring: green means more giraffes or lions; tan/white means fewer. For giraffes, on the whole, we get more giraffe photos in places that have more giraffes. That’s a good sign. The scatterplot visualizes the map in a different way, showing the number of photos on the y-axis vs. the known relative densities on the x-axis. What we see is that cameras work okay for giraffes, but not so much for lions. Again, I suspect that this has a lot to do with the fact that lions are incredibly heat stressed, and actively seek out shade (which they then sleep in for 20 hours!). But lions are pretty unique in their extreme need for shade, so cameras probably work better for most other species. We see the cameras working better for giraffes, which is a good sign. We’ve got plans to explore this further. In fact, Season 7 will overlap with a wildebeest study that put GPS collars on a whole bunch of migratory wildebeest. 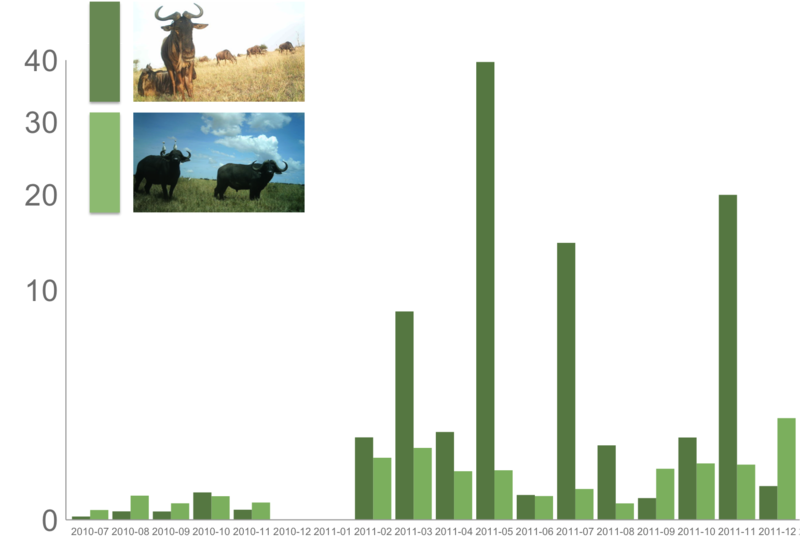 For the first time, we’ll be able to compare really fine scale data on the wildebeest movements to the camera trap photos, and we can test even more precisely just how well the cameras work for tracking large-scale animal movements. Exciting! 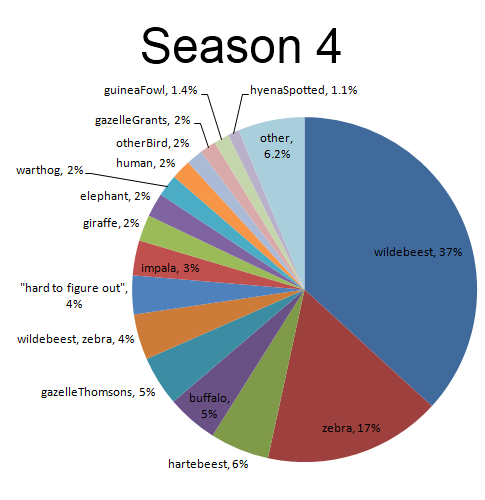 Over the last few weeks, I’ve shared some of our preliminary findings from Seasons 1-6 here and here. As we’re still wrapping up the final stages of preparation for Season 7, I thought I’d continue in that vein. One of the coolest things about camera traps is our ability to simultaneously monitor many different animal species all at once. This is a big deal. If we want to protect the world around us, we need to understand how it works. But the world is incredibly complex, and the dynamics of natural systems are driven by many different species interacting with many others. And since some of these critters roam for hundreds or thousands of miles, studying them is really hard. so we see them more often than we really should — meaning we might think there are more of that critter than there really are. There are statistical approaches to deal with this kind of bias in the photos, but these statistics are really complex and time consuming. This has actually sparked a bit of a debate among researchers who use camera traps. Researchers and conservationists have begun to advocate camera traps as a cost-effective, efficient, and accessible way to quickly survey many understudied, threatened ecosystems around the world. They argue that basic counting of photographs of different species is okay as a first pass to understand what animals are there and how many of them there are. And that requiring the use of the really complex stats might hinder our ability to quickly survey threatened ecosystems. So, what do we do? Are these simple counts of photographs actually any good? Or do we need to spend months turning them into more accurate numbers? Snapshot Serengeti is really lucky in that many animals have been studied in Serengeti over the years. Meaning that unlike many camera trap surveys, we can actually check our data against a big pile of existing knowledge. In doing so, we can figure out what sorts of things cameras are good at and what they’re not. Comparing the raw photographic capture rates of major Serengeti herbivores to their population sizes as estimated in the early 2000’s, we see that the cameras do an okay job of reflecting the relative abundance of different species. The scatterplot below shows the population sizes of 14 major herbivores estimated from Serengeti monitoring projects on the x-axis, and camera trap photograph rates of those herbivores on the y-axis. (We take the logarithm of the value for statistical reasons.) There are really more wildebeest than zebra than buffalo than eland, and we see these patterns in the number of photographs taken. Like we saw the other week, monthly captures shows that we can get a decent sense of how these relative abundances change through time. So, by comparing the camera trash photos to known data, we see that they do a pretty good job of sketching out some basics about the animals. But the relationship also isn’t perfect. 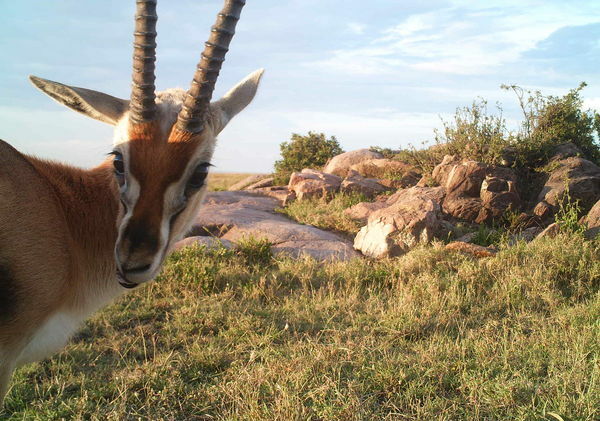 So, in the end, I think that our Snapshot Serengeti data suggests that cameras are a fantastic tool and that raw photographic capture rates can be used to quickly develop a rough understanding of new places, especially when researchers need to move quickly. But to actually produce specific numbers, say, how many buffalo per square-km there are, we need to dive in to the more complicated statistics. And that’s okay.